Cardfight Vanguard Local Tournament Open TCG play (free) Tournament play ($6) – Special Fight Pack upon entry – Exclusive prize awarded to 1st place Beginners a HIGHLY ENCOURAGED to stop in and learn how to play with one of our Cardfight Vanguard experts. Accessories, boosters, and single cards are available for purchase or trade. 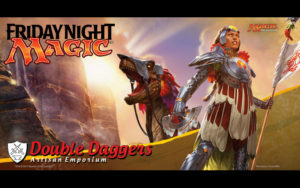 Friday Night Magic Draft $10 Casual $15 Competitive Players choice on type of draft! Official Pokémon League Open TCG play (free) Tournament Play ($5) Beginners a HIGHLY ENCOURAGED to stop in and learn how to play with one of our official Pokémon Professors. Accessories, boosters, and single cards are available for purchase or trade. Yu-Gi-Oh! Win-A Box Tournament Open TCG play (free) Tournament play ($10) – 2 OTS packs with entry – 1st Place takes home the box Please be EARLY! Late arrivals may be assessed a Round 1 loss. The later we start, the later we finish. Accessories, boosters, and single cards are available for purchase or trade.